Silver looks as if it may retest the lows on the trendline. If it does fall that low, any fall below may induce another puke up of shares/futures as a major technical support area may have failed. 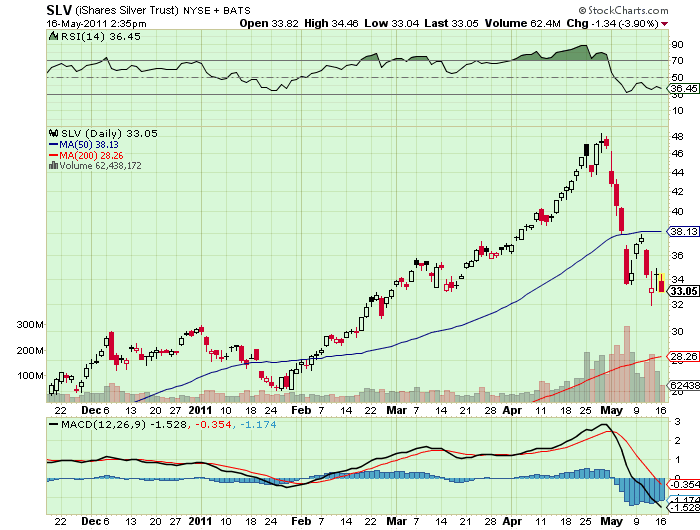 On the basis so far of no word on QE3, Silver for the moment looks like a dead trade. The energy trade is also looking the same way. 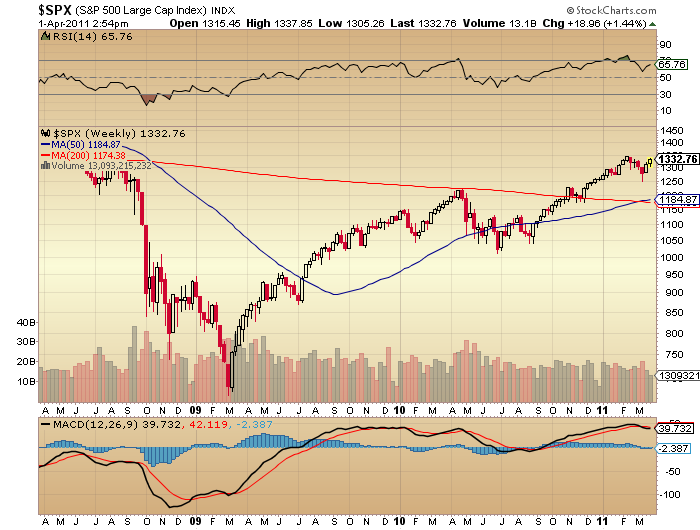 Without a QE3 and inflation trade, energy and associated stocks look to be trading lower. The rotation out of the energy sector into the defensives has been underway for a couple of months now. It would seem that we are slipping into stage 6. QE2 has grossly distorted the clear identification of the classic stages through a suppression of interest rates, which would normally rise as Bond Par’s fell. That the falling demand, which would drive this process, has been picked up by the Federal Reserve to the tune of $19 Billion -a – week POMO stands as evidence. The US dollar stands as proxy for rising interest rates. If interest rates rise, gradually foreign investment flows into the debt market as and when US rates on a risk adjusted, inflation adjusted basis exceed returns elsewhere. 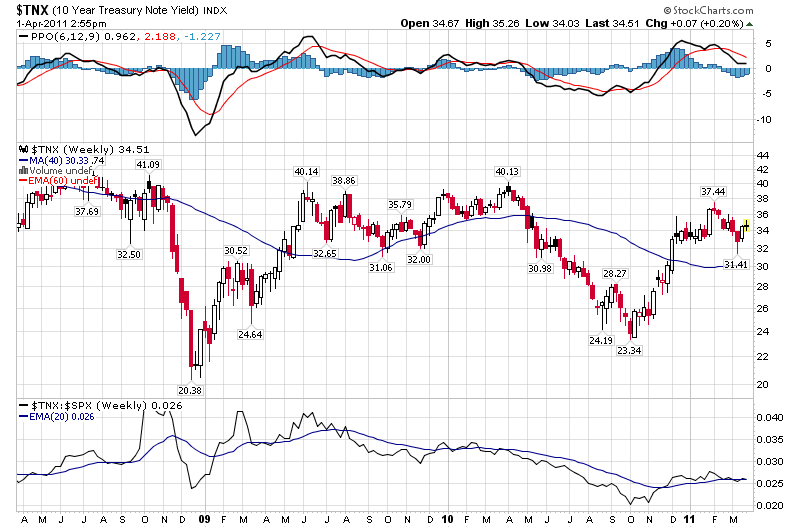 As the US is still AAA credit rated, even though interest rates are not yet rising due to the death throes of QE2, without a QE3, interest rates along the yield curve will rise. Hence the early traders in the US dollar are playing this trend. Consumer Goods and Medical are classic defence sectors, and are indicative of the late market rotation in the business cycle. An incredibly detailed breakdown of the various sectors. Notice energy down near the bottom. It is slowing. 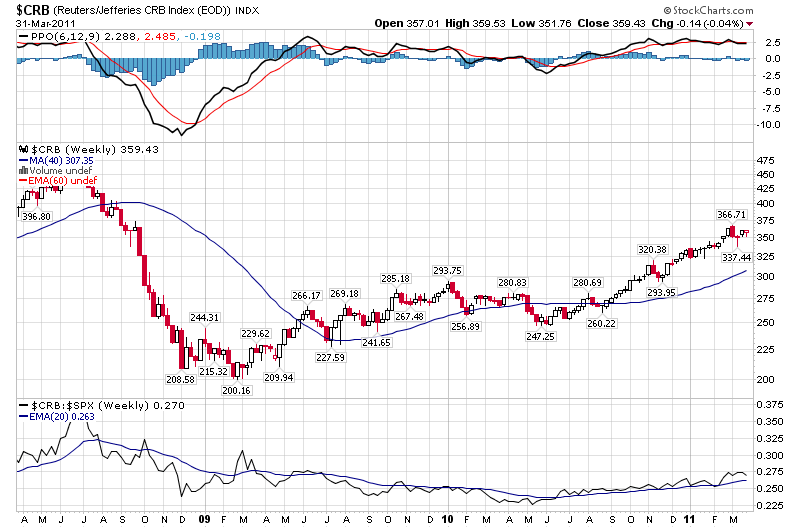 While oil is still high, with the completion of QE2, the money pumping will slow, at least for a time, which will be bad for commodities in particular. Again note Silver slowing, Heavy Construction slowing, courtesy of China. 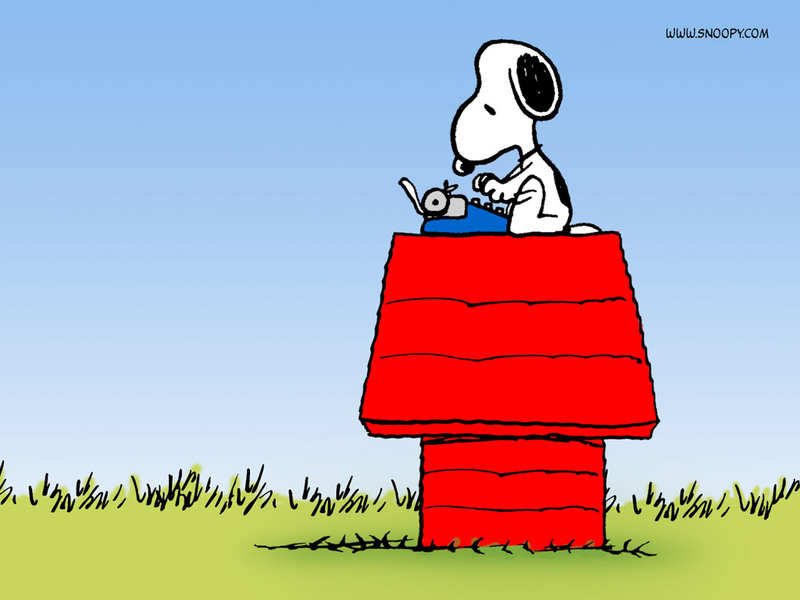 Airlines. Tend to move best in the early recovery cycle, which is not where we are currently. They also respond to oil, which is very much where we are. If oil falls in price, which is likely once QE2 ends, airlines benefit, the more it falls, the more they benefit. We can see buying where we did, looks, currently, to be possibly the bottom of this cycle. Sector rotation continues to signal a change from cyclical bull market, back into the secular bear. Energy is gradually losing momentum, with Consumer Staples gaining momentum. Gradually we will see the falling away of Consumer Staples into Utilities. Great performance by the most boring old-guard defensive names this week in the consumer goods sector (KFT, PG, HNZ, MO, PEP) and a miserable performance by the former leaders in the basic materials sector (FCX, AA, APA, OXY, SLB). Does this tell us something about the personality changing in the market or is this just a knee-jerk reaction to bid up defensive stocks into downticks? I still remain relatively bullish even though another defensive group, utilities, entered my radar late this week. We don’t know who the next leaders in this market will be next week. 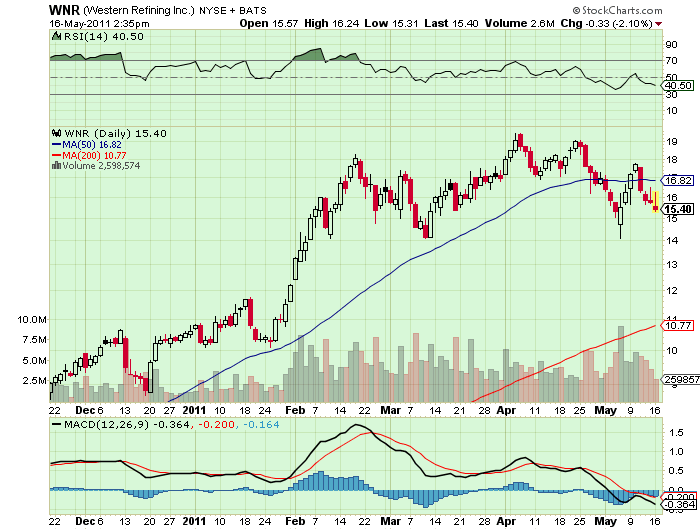 I’m thinking select basic materials (BHI, CVX, HAL, COP), industrials and tech could possibly regain leadership roles. Also seeing strength in some utilities (AEP, ETR, SO, EXC) which may or may not be an ominous sign. There is a surefire way for those with an agenda to push broad indexes higher and that is to buy tech and buy dow components. If you can keep a bid in those markets we will not have more meaningful downside. 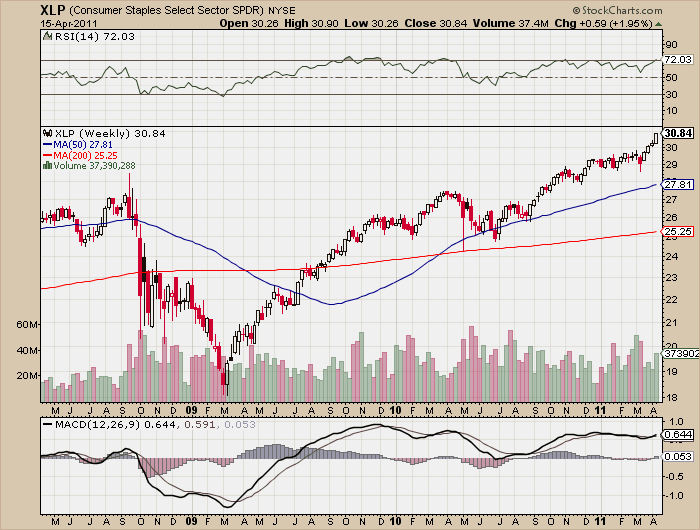 Financials (BAC, V, MA, AXP, C, GS) still look suspicious and of almost no interest to me still. As we are primarily concerned with the Stock sector, what sector is likely to outperform into the last cycle before stocks broadly fall? 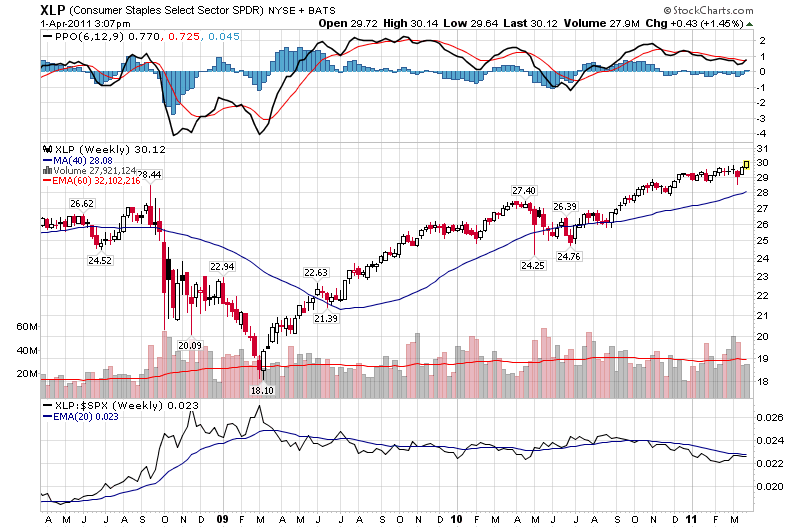 Energy is the part of the late expansion in a market sector analysis: the last sector to participate in an expansion prior to a fall in the market are Consumer Staples. Q1 is over, what next? 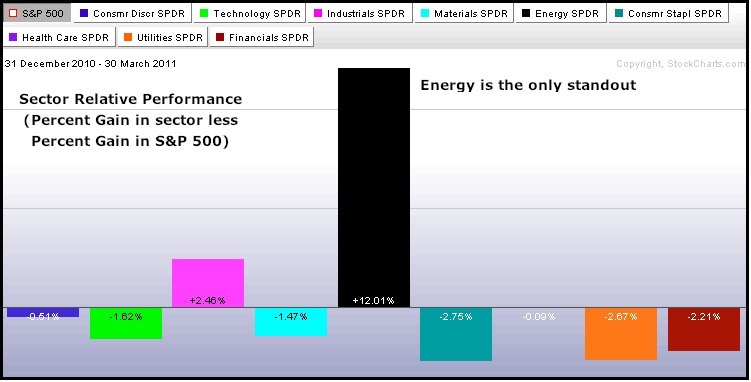 The trade for Q1 was energy. Essentially this trade was driven by inflation. With oil rising back to near 2008 highs, the energy stocks complied. So where to in Q2? From the charts we can conclude that we are in a stage 4 scenario. Thus at some point, we are likely to enter Stage 5, where Stocks turn down, largely due to rising interest rates in the Bond market, while commodities, under the driver of inflation, continue to rise.